the Hydro-stimulation Spa system. 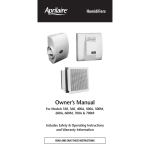 Take careful note of all safety warnings and precautions and only use this equipment as described in this manual. Please Check your Hydro-stimulation Spa! Read all safety warnings and precautions in full before operating the 5400 FB Hydrostimulation Spa. Be sure to follow all safety and operating instructions. 2. Place the 5400 FB power supply and caddy on a level, stable, dry surface. 3. Dry hands thoroughly before operating the 5400 FB power supply. 4. Use the 5400 FB Hydro-stimulation Spa in a well-ventilated area. 5. Unplug the power cord from the wall when unit is not in use. Operate the 5400 FB Hydro-stimulation Spa without the GFCI power cord supplied. Allow children to operate the 5400 FB Hydro-stimulation Spa. Handle the 5400 FB Hydro-stimulation Spa with wet hands. Disassemble the 5400 FB power supply. Place the 5400 FB power supply in water. Attempt to repair or service the 5400 FB power supply unit yourself. Replace fuses with ratings other than specified. Use the 5400 FB Hydro-stimulation Spa for any purpose other than described in this manual. the unit would be restricted. 10. Operate the system during electrical storms. 11. Pick up the carry caddy by the power pack handle. become damaged in any way, disconnect and contact an authorized repairer. become familiar with the restrictions placed on the system before continuing. Become Familiar with Each of the Individual Components of the System. 1. Any individual that is pregnant or may be pregnant should not use the system. 2. Any individual that has transplanted organs should not use the system. pacemaker) should not use the system. 4. The system may only be used for a maximum period of 35 minutes per use. 5. The system may only be used every other day. 7. Only one individual may use the system during any session. 8. DO NOT use any additives in the water other than those recommended in this manual. What Kind of Water Should be Used with the System? commonly used type of water. Distilled or reverse osmosis water is not recommended. Rings, Strips and DC Cables. The Aqua-Chi Model 5400 FB Hydro-stimulation Spa is a state of the art, bio-energy charger. the different biological processes that occur. are deprived and poor health can result. invigorating effects on the body when bathed in. Chi; the transference of energy through water. can vary for different individuals. 1. Various tingling sensations in parts of the body. 2. A shortness of breath during or towards the end of the session. 3. A slight discomfort in an unhealthy region of the body. These sensations generally only last a few minutes after the completion of the session. user should do so. You should wait 48 hours before attempting the footbath again. condition; nor does it pull, push or force foreign toxins or materials from the body. adjust it by turning the adjust knob. look like the illustration to the right. look like the illustration to the left. illustration, it will need to be adjusted. left until the needle is pointing to zero. inlet located at the rear of the power supply. and is firmly in place. 1 Plug GFCI into a grounded receptacle. 2. If light is not on, press reset button - light should come on. 3. Press test button - light must go OFF. DO NOT USE THIS EQUIPMENT IF THE ABOVE TEST FAILS! If the GFCI passes the test, you may continue with the set-up. The unit is now connected for operation. (recommended) for operating the system. not turn the timer past 10, the system will not come on. turned on, the green indicator light will be illuminated. the steps in this section. output will be low, when water conductivity is high the output will be high. The system must be on to adjust the output. further the power control knob is turned. gently stirred. Once stirred, check to see if the display is within the recommended range. conductive. If this occurs, dispose of the water and start over with fresh water. to the user. Ring wear will be increased unnecessarily. During the Session a Number of Rules Apply for the Proper Use of the System. Now set-up is completed - the system is ready to use. DO NOT remove and replace the feet during a session. DO NOT remove any water. DO NOT turn the system off and back on again. DO NOT remove the spa module from the water and place it back again. remove the feet and quit the session they should do so. correct setting. The system is now operating. of the session, the unit will turn itself off. indicating the session has ended. Once the session has ended, remove the feet from the footbath and dry them thoroughly. session in a responsible manner. replacement due to wear. The connecting strip attaches to ring 2 and ring 6 as illustrated. The amount of wear on the rings and the strip is subject to local water conditions. Rinse the spa module thoroughly under running water to remove any loose material. water to remove cleaning solution. components will occur. Such damage is not covered by warranty. DO NOT use a toothbrush or any kind of cleaning tool on the spa module. surface of the ring identify this wear. strip comes free from the top plate. provided in the support leg. around both the inside and outside edges. slot provided in the support leg. then drop into the locator cradle. Refer to slot and cradle illustration. the top disc in the number 1 position. service slot all the way into the spa module. housing plate of the spa module. the ring as shown in the illustration. by blowing the safety fuses. cable is also subject to wear when used under water and will eventually need to be replaced. cease to function. To remove these deposits, longer soaking in the CLR solution is required. them is formed or if they are dirty when the unit is being used. recommended that a new ring and strip set be installed to ensure proper operation. Indicator light on the GFCI is not switched on. indicator light on the supply firmly. Press the reset button on the GFCI. plugged into the power supply firmly. Turn the timer on past 10.
clockwise to switch on the power supply. the power pack to the rear of caddy and lifting out. which clearly shows the date of purchase and place of purchase, is required. The 5400 FB is designed and built to comply with UL & CE mark requirements. 7. The GFCI installed on all Aqua-Chi units meets or exceeds the UL trip thresholds. Footbath, 12 Foot Bath Liners. Product used for a purpose other than that described by the user manual. Product that has been modified or repaired by anyone other than an authorized repairer. Product that has been subjected to accident, misuse or abuse. All accessory and consumable items including: positive ring & strip sets, the copper ring, fuses, DC cable, and the carry caddy. authorization information, contact your place of purchase.